Cut and Serve Your Food With The Same High Quality Tool! Make serving food incredibly easy with this great tool. It is a high quality knife and a serving spatula in one. There is no longer a need to dirty two different utensils just to serve food. This one tool is perfect for both cutting and serving and it is quick and easy-to-use. The high quality materials, and Swiss engineering ensure that this serving knife will provide years of use. Its serrated blade is super sharp, and will easily cut through your food with little effort. 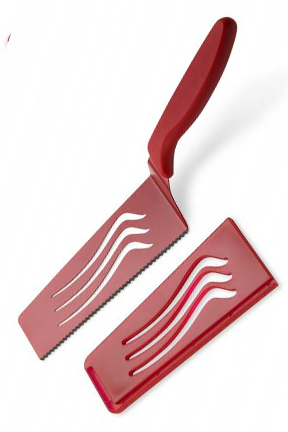 A nonstick coating ensures that the knife will glide effortlessly as you slice, and food won't stick as you serve it. The long, wide shape makes it perfect for serving pies, cakes, lasagna, and more. A unique handle design allows you to easily get all the way into the pan, and remove food in one piece for an amazing presentation. Simply slice your food, and then rotate the knife to remove it. Cut and serve food in one easy motion! It also works great on the griddle too. Use it to flip hamburgers, pancakes omletes, french toast and more. No more destroying food as you serve it. This tool makes it easy for anyone to serve the perfect piece of food. A handy protective sheath keeps your knife looking good and performing great for even longer. Simply slide it in the sheath, and toss it in the drawer without worrying. Tired of having all those beautiful dishes you cook fall apart when you serve them? Kuhn Rikon's Large Serving Knife is the answer. Now you can easily cut your food and serve it with the same great tool. You can even use it like a regular metal spatula for flipping hamburgers, omlettes and pancakes. You get the power and ability of two tools at all times, but you can always use just one or the other. When you do require the dual ability, you will be able to cut stuff, and flip or maneuver it without getting more than one utensil dirty. This incredible gadget features a nonstick surface that allows food to glide easily from pan to plate. Serve that special pie, cake, brownies, lasagna or meatloaf with ease, thanks to this Large Serving Knife. The combination knife and spatula has a serrated blade for easy cutting and the nonstick spatula offers quick release with no mess. The metal spatula is storng, but flexible, and it tapers toward the end so picking up food is a quick and simple process. This is the perfect tool to have for dinner parties or large gatherings. It also makes a great gift too. Give it as the perfect hostess or shower gift. Get this high quality kitchen gadget to make serving food incredibly easy. Order Yours Today! Overall Dimensions 11.5" x 2.5"
Bade Dimensions 6" x 2.5"
Kuhn Rikon Large Serving Knife - High quality materials and superior craftsmanship make this Swiss made kitchen gadget a must have. A great accessory for anyone that enjoys cooking. Discover the easiest way to cut and serve food. Great for cakes, brownies, pies, lasagna and more. Black or Red. With a Double-Sided Grill Plate And Variable Temperature Control.